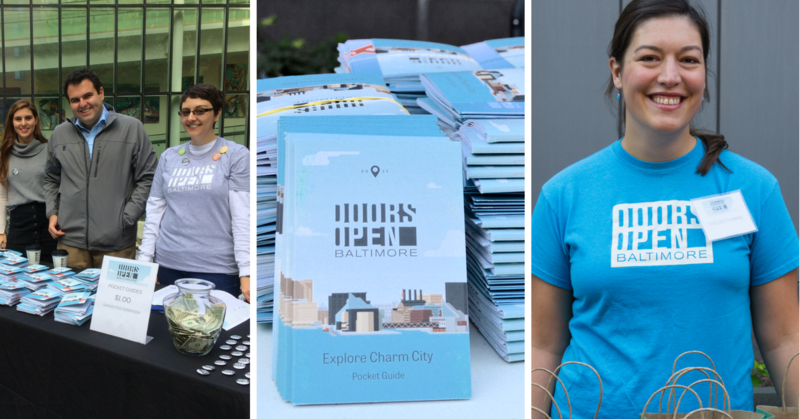 Learn about Doors Open Baltimore 2018 volunteer opportunities and mingle with fellow Baltimore architecture enthusiasts at the Mt. Vernon Marketplace! Doors Open Baltimore is taking place this year on October 6 & 7. Our goal is to recruit 200 volunteers. Volunteering gets you behind the scenes of the city’s most interesting buildings, allowing you to experience Baltimore like you’ve never seen it! Be sure to check out the the amazing vendors in the marketplace! A percentage of sales at select stalls will go to support Doors Open Baltimore. The event is co-hosted by Yelp Baltimore. Giveaways include Yelp pint glasses, shot glasses, and bags! Sign up to be a Doors Open Baltimore volunteer at the happy hour and you’ll be entered into a raffle to win a free tour of the Domino Sugar Factory on the afternoon of Friday Oct. 5! Mt. Vernon Marketplace is located in what was once the main warehouse and furniture retail store for the Hochschild Kohn department store chain, which closed in 1983. The building was renovated by Marks, Thomas Architects (Moseley Architects) into apartments and the Mt. Vernon Marketplace. The marketplace features 14 purveyors offering a wide range of delicious food and drink. ← Downtown Baltimore Architecture Tours: 225 N. Calvert St.